November 2018 in the Village Hall, Houghton. throughout the District for their help to her in learning to ring. Knights-Whittome, seconded by Jenny Watson as a true record. being provided by the Longcot Ringers and lunch at the Fox and Hounds, Uffington. 6. Loss of members through Death. After a short period of silence, the Chairman recited the words of the Requiem. Caroline Fairley, seconded by Edmund Wratten. – both confirmed on a show of hands. 8. Election of new ringing member. Smith – elected on a show of hands. District members could join the Ropley Practice if they are having one that week. contact Roger at r.g.booth@gmail.com or telephoning him on 01962 735972.
were proposing to transfer from Andover to Winchester. via its website and social media. maintain the Micheldever bells by the band: Elizabeth Johnson suggested that it would be worth inviting Roger Booth to check their handiwork. and Broughton had commissioned one of the bell-hangers to examine their bells, at a cost of about £250. The meeting closed at 5.59 p.m. This month’s Beyond Bob Doubles will be at King’s Somborne on 28th November from 19:30-21:00. Anything from Grandsire Doubles and Stedman up to Cambridge, everyone is welcome whether from the Winchester district or beyond. The following is an article the Micheldever Band is very grateful to have had printed in the Dever News as part of their appeal to raise funds for new ropes and ahead of their Tower Open Morning of the 17th November. Please look out for a follow up report next week with some good news! It was thanks to the curiosity of new bell-ringer Sharon Duncan-Reynolds that we made the discovery. Sharon wanted to go up the tower to see what the bells actually do and as local ringing master Edmund Wratten happened to be present that day, he led the way. Donning ear defenders, they watched carefully as a ringer below pulled the bell ropes. That is how we discovered that, even when the lightest bell was rung, the huge metal bell frame moved against the wooden frame on which it is mounted. That was last autumn and as a result we were prompted to give serious thought to the whole state of the bell chamber. Work immediately started to stabilise the frame and until it got too cold for further work most of the 60 or so rusted lower bolts,which are over 60cm long, were loosened (with more than a little effort) greased and retightened so stopping any movement of the metal frame. Since the spring the 40 or so top bolts have received similar treatment. Next we tackled the rusting frame itself – cleaning with wires brushes and white spirit, followed by the application of rust preventing undercoat and rust preventing top coat. The plain bearings on which the bells hang, having accumulated years of solidified grease, have been cleaned out, new felt pads inserted and the bearings re-greased. The wooden frame has received wood preserver and the whole bell chamber cleaned out. The pictures reveal the difference that has been made but probably don’t quite show how awkward it is to get at some parts of the frame or how dirty we have been getting crawling around it. It is clear that little maintenance has been carried out for quite some time. Apparently Harry Symes, blacksmith, bell ringer and steeple keeper for many years, who made the rope guide for the church but died in 1991, used to keep the bells in immaculate condition. It is said that his family kept the bells maintained while there was no ringing during WWI so that when peace came they were ready to ring out. The current team cannot claim to live up to those standards but has put in its best effort and it has been a team effort; there is no way this could have been done without lots of hands on the job and even so it has taken a couple of months intensive work each Tuesday to get the cleaning and painting done. We now at least all have a better appreciation of what it takes to keep the bells going. We do have one thing to ask though. We have all put in labour and some cash to do this work; no charge has bee made to the Church. The Church did pay £200 this year to replace a rope for us, for which we are very grateful. But our 5 remaining ropes urgently need replacing; one has a temporary repair and another will very soon need the same. We need £1000 to allow us to replace our 5 remaining ropes and keep the bells ringing at Micheldever for the next 10-15 years. Please can you help. Any donations would be gratefully received. They can be given to Belinda Hughes, or posted into the box in the door to the tower in the corner of St Mary’s. Cash is great or cheques should be payable to Micheldever PCC. Please consider completing a gift aid envelope so we can claim the tax back on your donation. We will be ringing for the service of remembrance on 11 Nov and again at 12:30 pm as part of the national celebration of the centenary of the Armistice in 1918 – Ringing Remembers. Church bells across the country will ring out and Big Ben will strike. We invite you to join us if you would like to see the bells being rung and to get a feel for a bell rope afterwards. We always welcome new ringers. Bell ringing team:- Andrew Tollyfield (steeple keeper), Juliet Pattison (tower captain & secretary), Mary Tiles, Felicity Botham, Belinda Hughes, Sharon Duncan-Reynolds, Ben Bell and with help for practices from Charlotte Smith (Kingsworthy). Also special thanks to Charlotte for her help working with the team on maintenance. Open Morning – St. Mary’s Micheldever – Saturday 17th November – 10-12am. For Health & Safety reasons visitors wishing to go up the tower must be fit and healthy and wear suitable clothing/footwear. Children under the age of 16 must be accompanied by an adult. Unconfirmed Minutes of the Quarterly District Meeting held on Saturday 11 August 2018 in the Churchyard, the Parish Church of St John the Baptist, New Alresford. Chairman’s Welcome. The Chairman, John Croft, opened the meeting at 12.47 p.m. with a welcome to those present and thanks to the Revd Myles for the use of the bells of New and Old Alresford, to Elizabeth Johnson for securing the use of the John Pearson Hall and to Bruce Purvis, District Secretary, for devising and checking the route of the planned walk to Old Alresford. Attendance. The following nine District members signed the attendance register (representing five towers with one member unattached): Tessa and Tony Smith (Hursley), Stephanie Hodnett, Elizabeth Johnson and Ian Redway (New Alresford), Rodney Skinner (Ropley), Bruce Purvis (Winchester Cathedral), Christine Knights-Whittome (Wonston) and John Croft (unattached). Apologies for Absence. Apologies were received from Drew Craddock (Hursley), Sue Spurling (King’s Somborne), Charlotte and Jonathan Smith (Kings Worthy), Andrew Johnson (New Alresford), Andrew Glover (Romsey), Sue Craddock and Jenny Watson (Sparsholt), Gerry Cornick and Paul Fitzgerald (Wonston) and Joyce Croft (unattached). Minutes of the Previous Meeting. The Secretary apologised for the fact that the appendix to the minutes of the Quarterly District Meeting, held on 12 May in Cheriton Village School and listing the personnel of the Striking Competition Teams, was missing, and stated his intention to complete the lists for the record. The minutes of the Meeting were adopted on the proposal of the Secretary, seconded by Elizabeth Johnson as a true record. Matters Arising. Minute 6, ‘Matters arising’, 15: AOB item 6, on a bell-maintenance course. Elizabeth Johnson reported that Roger Booth had been approached and was amenable to the suggestion that he arrange and deliver such a course. Fairley, seconded by Bruce Purvis. Jenny Watson, seconded by John Cleverley. – all confirmed on a show of hands. Election of new ringing members. proposed by Stephanie Nicholls, seconded by Alison Martin. Ben Bell of Micheldever, proposed by Mary Tiles, seconded by Edmund Wratten. – all elected on a show of hands. i. District Practice, 21 August. The Secretary reported that he had enquired whether Twyford would be available, and had learned that only the Tower Captain would be around on that date. He was absolved of further efforts to find an alternative tower. ii. Guild Education Day, 13 October. Christine Knights-Whittome advised that the Guild Education day, on Plain-hunting and Treble-ringing on five bells, on 13 October would be held at Church Oakley, in the Basingstoke District. iii. District Autumn Outing 22 September or 20 October. The Secretary expressed a preference for the October date for the Outing, and Tony Smith requested that the date be put back by a week to avoid a clash with the Hursley Tower outing. The meeting approved the date of 27 October. iv. Guild Education Day, 24 November. Christine Knights-Whittome advised the meeting that the subject of the Education Day at Sherfield English on 24 November would be Cambridge and London Surprise Minor. The meeting closed at 1.01 p.m. Please find attached the poster for the next Winchester District Quarterly Meeting, which is to take place in Houghton – All Saints’ Parish Church (the District’s newest and lightest six) for the training session plus whatever post-meeting ringing anyone feels like, and the Village Hall for the tea and business meeting. Paperwork for the business meeting will follow in due course. For this meeting we are rehearsing our skills in Cambridge and its sister methods – Primrose, Ipswich, Annable’s London, etc. This afternoon session will to some extent complement the Guild Education Day School a fortnight later. If you’d like to come along, and wish to branch out from Cambridge, please let Jenny Watson know so that we can gauge the level of interest. This month’s Beyond Bob Doubles will be held on the ten at North Stoneham from 19:30 to 21:00. In addition to our normal five and six bell repertoire it will be an opportunity to ring on eight and ten, so please come and encourage others who can benefit from this opportunity. 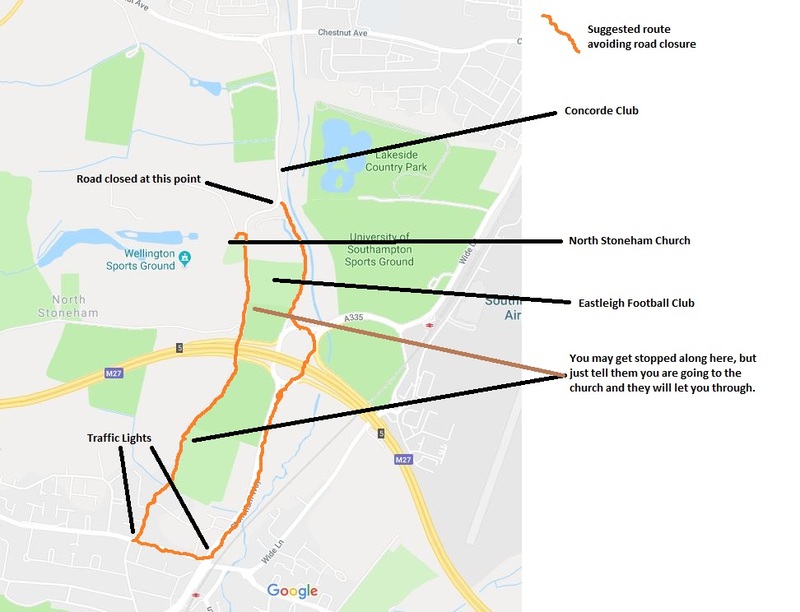 Please note that the northern end of Stoneham Lane is shut and so people coming from the Eastleigh end cannot go past the Concorde club, you can only access the church from the southern end of Stoneham Lane. Beyond Bob Doubles will be held at Sparsholt on 26th September. Plain bob, little bob, Kent, and Cambridge minor, also grandsire, St Simon’s, and Stedman doubles etc. if anyone wants those, just let me know on the night. All welcome from the District and beyond. Minutes of the Quarterly District Meeting held on Saturday 12th May 2018 in the Main Hall of Cheriton Primary School. Chairman’s welcome: The Chairman, John Croft, opened the meeting at 5.28 with a welcome to those present and with thanks to Craig Robb and Katie Hinds, Elizabeth Johnson and their helpers for laying on a splendid ringers’ tea, to the Rector, the Revd Graham Bowker and the Wardens for the use of the Cheriton bells. Attendance: The following eleven members of the District signed the attendance register (representing five towers with one member unattached): Christine Hill and Tony Smith (Hursley), Jen Churchill and Gary Davies (Lockerley), Elizabeth Johnson, Ian Redway and Tony Stirling (New Alresford), Jenny Watson (Sparsholt), Caroline Fairley and Bruce Purvis (Winchester Cathedral), John Croft (unattached); Katie Hinds (Cheriton) and Edmund Wratten (unattached) was also present. Striking Competition Results. John thanked the District for inviting him to judge the competition, saying that it was as enjoyable as ever, though not without challenges, ranging from the onset of rain from the outset, and the presence of persistent enquirers and the hum of a lawn-mower during the test entries of the second, third and fourth teams. He congratulated the four entrants for the method-ringing competition. Team A rang Cambridge Surprise Minor at a good pace, of four minutes, equating to a peal speed of 2h48’ . There was some initial confusion as the test-piece was introduced by two whole pulls; however, the overall standard was good. There was a hitch at 2½ minutes, causing cluster of faults, and there was some hesitation on occasion. The score was 12 faults. Team B rang Grandsire Doubles: again, this was a very steady piece of ringing, marred only by some unevennesses, such as gaps on the backstroke leads. The timing, at 4 minutes, equated to a peal speed of 2h48’. 14 faults were logged. Team C rang Plain Bob Doubles. The start was somewhat sedate, and thereafter the pace was uneven, evinced by gaps both on handstroke and backstroke leads. The peal speed was 2h50, and their score was 24 faults. Team D rang Plain Bob Doubles. After an uneven start, a good, steady piece of ringing ensued, with gaps causing the faults to accumulate. The peal speed was 2h48’, and the score was 15 faults. in first place, with 12 faults: Team A: Hursley. Sadly, no-one was present from last year’s winning team, with the trophy, and therefore no presentation took place. Apologies for absence. Apologies for absence were received from Tony Ayres, Keith Bartle, Jennifer Baxter, Roger Booth [pending his election], Drew and Sue Craddock, Joyce Croft, Adam Gawne-Cain, Andrew Glover, Andrew Johnson, Ian and Chris McCallion, John and Bren Palk, Christine and Barry Saunders, Sue Spurling, Jean Whewell, Isobel Wolf. Minutes of the Previous Meeting. The minutes of the Annual District Meeting held on 10 February in the Taylor Selwyn Room, the Education Centre, Winchester Cathedral. Their adoption was proposed by Bruce Purvis, seconded by Christine Hill, and adopted on a show of hands. Matters Arising. 15: Any Other Business, item 6: Bell Maintenance Course: Elizabeth Johnson advised the meeting that Roger Booth, who had considerable experience of bell restoration projects, had recently moved to New Alresford, and could be a valuable contributor to such an enterprise. 15: Any Other Business, item 7: Safety of Bells: Edmund Wratten suggested that one of the founders or bell-hangers could be engaged to examine multiple tower installations over a short spell of time, so as to spread the cost of accommodation and/or travel over a series of examinations. He was particularly concerned for towers that had no bands, and, therefore, with no direct experience of the condition of their belfries. Edmund suggested this undertaking could be borne at the District’s expense. Tony Smith remarked that a hurdle to such an enterprise could be securing of local PCCs’ approval. Other observations noted were: the typical cost of a founder’s inspection being £250; Lockerley and East Tytherley are having an inspection as it was now 15 years since the last inspection (Gary Davies), Whites of Appleton were too busy at the present time to schedule a visit to Old and New Alresford (Elizabeth Johnson). There was general consensus that initial enquiries could be made of the District’s towers to discover which would welcome a professional survey of their bells, and the Secretary was mandated to initiate enquiries. Loss of member through death. Valerie Keel’s passing was noted with sadness: a short silence was concluded with the chairman reciting the words of the Requiem. Simon Lucas of Hursley on 21 March 2018, proposed by Christine Saunders, seconded by Peter Hill. Sheila Piper of Lockerley on 24 April 2018, proposed by Jen Churchill, seconded by John Palk. Johnson, seconded by Ian Redway. All confirmed on a show of hands. Bruce Purvis advised the meeting that arrangements were in hand for the Spring Mini-Outing in a fortnight’s time, with ringing at Newnham and Rotherwick in the morning, followed by lunch at the Vine at Hannington, and ringing there and at Church Oakley, with the option of tea in Overton. Some fixtures in coming months were still subject to confirmation. General Data Protection Regulations. Tony Smith advised the meeting that the March meeting of the Guild Executive had determined that any recording and publication of Guild members’ contact details should be managed on a Guild-wide basis, and that creation of the District Directory would be governed by such a prescription. No proposals or plans had so far been published by the Guild officers. Tony Smith reminded the meeting that the District would have the opportunity to enter a band for the Inter-District Striking Competition on eight bells on the day, and was mandated by the meeting to arrange a District band. There being no further business, the Chairman declared the meeting closed at approximately 6.00 p.m.
Minutes of the Quarterly District Meeting held on Saturday 11 November 2017 in the Parish Hall, Owslebury. 1. Chairman’s Welcome. The Chairman, John Croft, supported by the Secretary, Bruce Purvis, opened the meeting at 17.33 p.m. with a welcome to those present and thanks to the Wardens of St Andrew’s for the use of their bells, and to Anthony Manship for securing the use of the Parish Hall, and to Liz Manship and the Twyford ringers for laying on a splendid ringers’ tea [applause]. 2. Attendance. The following 11 District members and three guests signed the attendance register (representing ten towers with one member unattached): Roy LeMarechal (Bishopstoke), Christine Hill and Tony Smith (Hursley), Sue Spurling (King’s Somborne), Carol Higgins and John Palk (Lockerley and East Tytherley), Elizabeth Johnson (New Alresford), Anthony Manship (Owslebury), Rodney Skinner (Ropley), Bruce Purvis (Winchester Cathedral), John Croft (unattached), Wendy Smart and Gail Robinson (Botley – guests), Robin Milford (Curdridge – guest). Also present was Edmund Wratten, District Ringing Master (unattached). 3. Apologies for Absence. Apologies were received from Andrew Craddock (Hursley), Charlotte and Jonathan Smith (Kings Worthy), Andrew Johnson (New Alresford), Andrew Glover (Romsey), Sue Craddock and Jenny Watson (Sparsholt), Christine Knights-Whittome (Wonston) and Joyce Croft (unattached). 5. Matters Arising. Minute 9, ‘Matters arising’, item iv: District Ringing Festival: The Secretary asked to be advised of any quarter-peals or peals rung during the ringing fortnight and to be counted as rung for the Ringing Festival to be notified to him..
by Sue Spurling, seconded by Gerald Lambert. proposed by Caroline Daniels, seconded by Martin Daniels. 10 October 2017, proposed by Caroline Fairley, seconded by Edmund Wratten. 7a. Election of new ringing members. Fairley, seconded by Edmund Wratten. – both elected on a show of hands. Certificates and badges were collected for local presentations to be made at Broughton, Cheriton, Hursley, Romsey and Wonston. The Secretary reminded the meeting of forthcoming District events: District practices on 20 November at Houghton, at North Stoneham on 19 December (to be confirmed) and at Kings Worthy on 12 January, also the Carol Service on 9 December at Broughton; also that there was a Guild Executive on 18 November, should anyone wish any issues from the District’s affairs to be raised there. The Treasurer reminded the meeting that the 2018 Annual Meeting of the District would take place on 10 February. i. 200 Club. Robin Milford reminded members that the 200 Club was active, with application forms available, and that subscriptions would qualify for next Saturday’s draw at the Guild Executive. This prompted a lively discussion on the question of the number of draws to which a stake would entitle a subscriber. It was agreed that Robin would seek to clarify the issue at the Guild Executive. ii. Annual Outing. Elizabeth Johnson thanked the Secretary for arranging the Outing on 21 October in the New Forest, which, although attended by relatively few [12 throughout the day], had been greatly enjoyed by those who did attend. iii. Annual Report. The Treasurer reminded the meeting about the new arrangement for the supply of the next edition of the Annual Report and suggested that when tower officers were collecting next year’s subscriptions, early in the new year, they should use that opportunity to collate individual requests for the new report. iv. Ash for Stays. Elizabeth Johnson brought to the attention of the meeting the Monkswood Saw Mill as a good source of ash for stays: the firm was to be found on the road from Old Alresford to Preston Candover, opposite a carving of a bear. vi. District Directory. Tony Smith was pleased to announce the publication of the District Directory for 2017, and to record his thanks to John Dodd for his work in printing it: Tony was thanked for his care and his efforts in compiling the Directory. viii. New Alresford Practice. Elizabeth Johnson advised the meeting that owing to a calendar clash the New Alresford practice on 8 December would be held at Old Alresford. ix. Romsey Show. John Palk gave a review of the Romsey Show: on the eve of the Show there had been heavy rain, resulting in a very muddy pitch. With some 20,000 visitors to the show, the day was busy at first, but was quieter through the afternoon. The mini-ring being the chief attraction, Graham Wright was presented – after some careful spying-out – with a bottle of toffee-flavoured vodka, bought from a stall in the food-and-drink marquee. Despite shows of interest, no-one asked for further information on or introductions to ringing. x. Ropley. At Roy LeMarechal’s request, Rodney Skinner briefed the meeting on progress at Ropley. He advised the meeting that at present information was being released gradually. At the moment, work on the church was subject to delay for up to four weeks whilst archaeologists surveyed previously unknown graves in the body of the church. The bells remained in store at Matthew Higby’s works in Somerset; there was a possibility that the 5th would have to go to Italy to be recast, having been cast in loam and for historic integrity having to be recast in loam, a technique no longer available locally. The timeframe for the rebuilding of the church and rehanging of the bells was said to be two years. xi. Stockbridge Practices. Sue Spurling advised the meeting that as the King’s Somborne band now provided the ringers and ringing for Stockbridge, the band would be holding its last practice every month at Stockbridge. The meeting closed at 6.05 p.m.
1. The over-provision turned out to result almost entirely from a combination of double-counting and an over-estimate of the numbers of people who might attend without having ordered tea. Just a final reminder: the District Practice will be going ahead at Preston Candover this coming Wednesday, 27th June. Poster attached for onward transmission to your members, containing the postcode for satnav users. Hope to see lots of you there on the day. There will be no Beyond Bob Doubles on 27th of June since there is a District Practice at Brown Candover on that day. As we look unlikely to get many ringers this coming Friday it has been decided to delay this month’s 12-bell practice until the fifth Friday i.e. 29th June. Beyond Bob Doubles will be at Easton on the 30th of May. Anything from Grandsire Doubles up to Cambridge Minor, all welcome. Stop Press! – our next District Practice is at Sparsholt a week tonight, Monday 21st May, and the District Mini-Outing is definitely going ahead, on Saturday 26th May, to include Newnham and Hannington, further details and posters etc. later today. The more keen-eyed observers of the District Calendar/Programme for this year will have noticed that we have an outing ‘pencilled in’ for Saturday May 26th – one month from now! So this email is just to give you advance warning, and an opportunity to put the date in your diaries. The format I plan is to have two towers before lunch, nice pub lunch somewhere, and two towers after lunch, and maybe round the afternoon off with tea/cream tea, depending on where we go. I shall try to keep it local so as to reduce the burden of extended travel. Please find here the poster for our next Quarterly Meeting, in Word 2003 and PDF formats. As always the May meeting is the occasion of our District Striking Competitions – methods and call-changes. Do think about whether you’d like to enter a band: it’s good experience which hopefully feeds into your service ringing as well as recreatioanl ringing. Hursley’s 4th Friday of the month 12 Bell practice is this week – Friday 27th. Anyone wishing to ring on 12 Bells is welcome to come along and join us. Hopefully we’ll be able to ring some or all of Cambridge, Yorkshire, Bristol Max, Grandsire and Stedman Cinques. But, as usual what we ring will depend on who comes along; so anything from rounds and call changes to Bristol Max. If you can’t make this week’s practice, you’ll always be welcome any Friday night. I have learned that EASTLEIGH FC are playing at home against EBBSFLEET FC next Tuesday, the night of our District Practice. You will NOT be able to get to St Nicolas from the North (i.e. past Concordes Night Club), only from the south, and even then you may have to explain to people in Hi-Vis tabards that you are going to the Church. Phil Nicholls has kindly provided a map explaining all, and it is attached. (Still) Hoping to see lots of you there on Tuesday. The District Training Session and a couple of days away last week caused me to fail to keep my eye on the ball … we have another district practice coming up soon, a week tonight in fact (Tuesday 17th April), at North Stoneham, on their light ten. It’s a great experience and the band will give you a warm welcome, so it’s an evening not to be missed, if you can make it. The poster, as usual, is attached, for forwarding to your members, if the opportunity to publicise via your notice-boards is felt to be limited. Hursley’s 4th Friday of the month 12 Bell practice this week Friday 23rd. Anyone wishing to ring on 12 Bells is welcome to come along and join us. Hopefully we’ll be able to ring some or all of Cambridge, Yorkshire, Bristol Max, Grandsire and Stedman Cinques. But, as usual what we ring will depend on who comes along; so anything from rounds and call changes to Bristol Max. Subject line says it all really, there’s a Winchester district practice at the lovely eight at Sherfield English on Tuesday 20th March.